CRO418 ADRIATIC Stylish Luxury Villa | MONTENEGRO Villas 2019 rental UNIQUE Vacation for You !!! 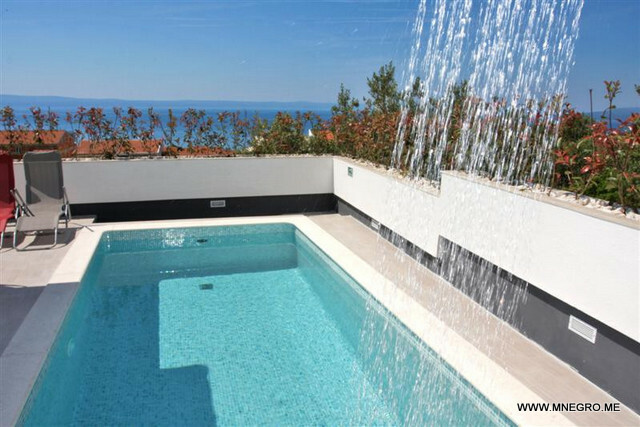 CRO418 ADRIATIC Stylish Luxury Villa – MONTENEGRO Villas 2019 rental UNIQUE Vacation for You !!! Vila is situated in the west part of Makarska – part of “Pozare” CROATIA ADRIATIC is famous for its long tourist tradition, is situated just 400 meters from the sea and 1500 m the city center and all city attractions, thanks to the beautiful sun-drenched position with large garden, surrounded by olive groves and indigenous vegetation provides privacy and quiet relaxation. The villa has 2 pool 6 x 3 m (counter-current swimming, massage and waterfall). Area: 150 m2 house, land, 500 m2, land on which the concept is built provides an excellent view of the sea and islands and sunny during the dana.Vila consists of ground floor layout is approximately 203 m2. Bathroom: Whirlpool corner bath / shower, washing machine. Room 1: double. bed (180 cm, length 200 cm). Exit to the terrace, the swimming pool. Room 2: double. bed (180 cm, length 200 cm). Exit to the terrace, pool, bathroom + shower / toilet and a whirlpool bath. Room 3: double. bed (180 cm, length 200 cm). Exit to the terrace, pool + bathroom / shower. Room 4: double. bed (180 cm, length 200 cm) + bathroom / shower . Kitchen: Open kitchen (4 hotplates, oven, dishwasher, glass-ceramic hob, freezer). Terrace 100 m2. Furniture, chairs. Facilities: Internet (Wireless LAN [WLAN], free). Please note: only small pets accepted. Parking in the yard and (Fitness can be a garage for the car).